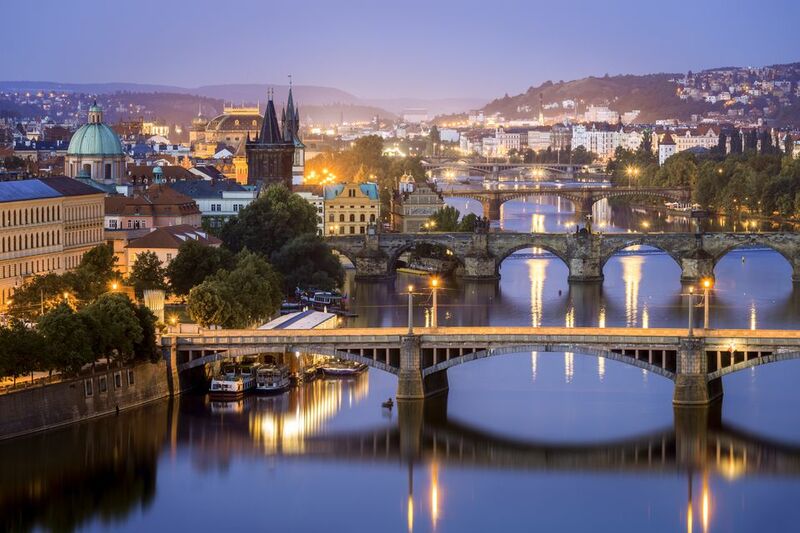 Prague is often called the Paris of Eastern Europe; it bursts with museums, great restaurants, gardens, and history. If you only have two days to get a taste of this exciting and beautiful city of tall spires, you need a plan. These two itineraries of Prague's high points can be flipped as Day 1 or Day 2, depending on your preference. Times given are only approximations. You might take more or less time depending upon your level of interest in each attraction, how many photos you take, and your visiting pace. Start your discovery of Prague with a visit to Prague Castle. The Prague Castle grounds, including its gardens, are free to explore, along with a small section toward the front of St. Vitus Cathedral. A fee is charged to tour the buildings or to take an audio tour. Exit Prague Castle via the main gate at the top of ​Castle Hill and onto Castle Square. Here you’ll find museums, palaces, and the perfect location for viewing Prague from above, just like Czech kings might have done in days of old. The walk from the Castle District into Mala Strana, or the Lesser Quarter, takes only a few minutes. You'll find hotels, restaurants, and embassies in picturesque Mala Strana but not many major sights. Charles Bridge is more than a bridge. It’s a symbol of Prague. From dawn till dusk it teems with tourists, artists, musicians, and souvenir vendors. Stop to admire the statues lining the bridge, look out over the Vltava River and take some photos. On the other side of the bridge stands a tower, which can be ascended for views of the surrounding area. If you choose to climb the tower, enter by the door, climb the narrow steps, and stop at the landing to pay the fee. Continue to the top of the tower and admire the views of Prague. It’s likely you will be hungry by this time. Follow Smetanovo Street to the south until you hit Narodni. Kavarna Slavia stands at the intersection of these two streets. An important Prague cafe — it was once the meeting place for revolutionaries — it is also a good place to stop and have a bite to eat or drink. When you're refueled and refreshed, continue following Narodni Street east until you reach Wenceslas Square. Wenceslas Square is one of New Town’s most famous sights and one of the most recognizable Prague squares. It is lined with hotels, shops, and restaurants. At the very end of the square looms the National Museum. Enter the square and take Jindrisska Street to your left. At this point, you can take another left on Panska Street to pop into the small but remarkable Mucha Museum (then follow Panska further, turning right on Na Prikope and following this street until you reach the Municipal House). Or you can follow Jindrisska until it curves into Senovazna (Jindrisska Tower, the tallest belfry in Prague, is where Jindrisska meets Senovazna Square) and follow Senovazna to Na Prikope to the Municipal House. The Powder Tower is on Celetna Street just south of the Municipal House. The Municipal House is a treasure trove of art nouveau work by Alfonse Mucha and other famous Czech artists. Unfortunately, if you’re only in Prague for the weekend, you likely won’t have time to take a tour of this famous landmark, but you can enter its lobby and cafe, which gives visitors an idea of what they can expect from the rest of the interior. Now you are in Old Town Prague, which can easily take up an entire day. At this point, you have done a lot of walking. Old Town offers plenty of places to eat and drink and a good place to stop for dinner. 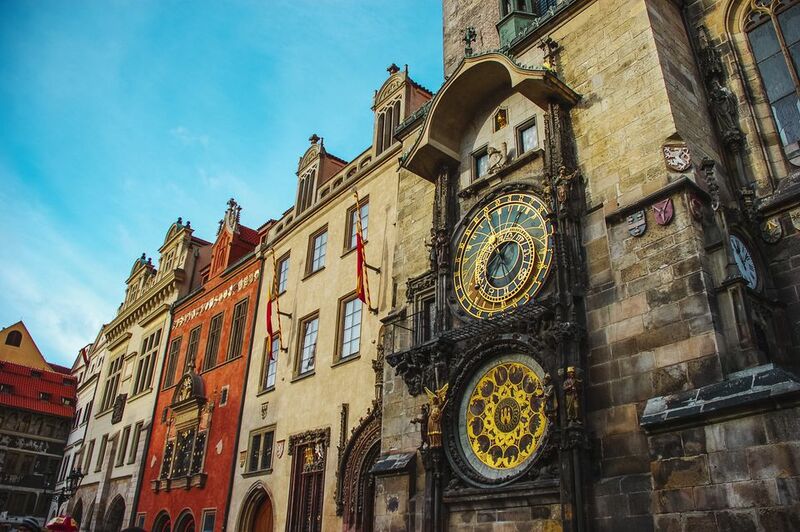 For a preview for your next day in Prague, you can head to Old Town Square, where outdoor dining options are plentiful and the beauty of the historic core is concentrated. Day two of your weekend in Prague is dedicated to sights in the Old Town. If you spent some time in Old Town the evening before, you will have already gotten a taste of what it has to offer. Start your tour of Old Town Prague in Old Town Square. The square is home to several important sights, including the Church of Our Lady Before Tyn, St. Nicholas Church, and the Old Town Hall. You will see people gathered in front of the Old Town Hall before its astronomical clock strikes the hour. They are watching the parade of figures that appear from doors in the clock. Or visit a Prague museum of your choice, enjoy lunch at one of Prague's charming cafes, or see a black light theater production. Is Black Light Theatre Brilliant Performance or a Tourist Trap?